Cried at Work in front of my Boss – How to Recover? Crying is often considered as the sign of weakness. Crying at work means, it is considered immature, no self-control and self-indulgent. You feel ashamed and low after your emotional outburst as there are many out there who would start pointing fingers or thinks of you as unprofessional. Why is crying emotion considered a taboo and how do we recover from it? We will discuss all this in the following article. Is Workplace Meant for Crying? Five days a week, you are spending your time at your office rather than at home. The more time you spend at workplace, higher is the probability for you to show your emotions to your peers. Nobody is god or super human, we all tend to succumb to our emotions be it a child or an adult. You can’t categorize places where you are allowed to cry and where you are not. So, stop being harsh on yourself if you have cried at your workplace. What can Lead you to Crying at Work? There is no harm in crying and showing off your emotions. Crying can be because of frustration, you can be overwhelmed with your responsibilities, not happy with your result or any other work related negative feedback. Like professional, you also have a personal life that gets affected by many factors. There could be a tragedy, a divorce case, a family dispute and many other things. Is Crying a Sign of Weakness? Many say that crying is a woman’s emotion but that is not the case. If you have read biography of Steve Jobs you can experience his crying emotion every now and then. It is not a woman thing but a human thing. Crying is not a sign of weakness and the reason for your career going bad. Let us see what is crying? Crying will not drain you out of power and self-confidence at work. Every single employee would have or will cry while climbing the ladder of success. It is nothing unusual or feministic to show your emotions when you are upset. We tend to be more harsh on ourselves post crying session and push ourselves to be stronger. It is not that you are hitting, throwing items or bullying someone; you are just letting your emotions out to feel better. You are not spoiling anyone’s day by shouting at them. You are not showing disrespect towards others or not being evil. You are trying to ease yourself off and it is nobody’s business to know why you are doing so. It is nobody’s right to make you feel that you are doing something wrong! If you are trying to control your emotions and thinking that you are being brave, then please rethink. You might cry for a minute or two, feel better and get in with your work with complete focus. By controlling your emotions, you will not be able to concentrate as subconsciously you are thinking about it! So, why waste your energy and time in controlling it and spoiling your day! A misconception that most of the female professionals hold is that if they cry in front of their male co-workers then it will hamper their career. There are many female executives who have cried at work and it has worked in their favour. You need not cry at every small thing, but if there is an emotional outburst you need not fear about the effects on your career. Be it male or female, everyone to the level of Steve Jobs has cried in their workplace. Crying is not a harmful emotion that you can show at your workplace. People who have anger issues are far more disruptive. People who are a bully and bossy are far more harmful to have a workplace. You are not harming anyone and not even causing any issues for someone else. How to Stop Yourself from Crying Infront of Your Boss? 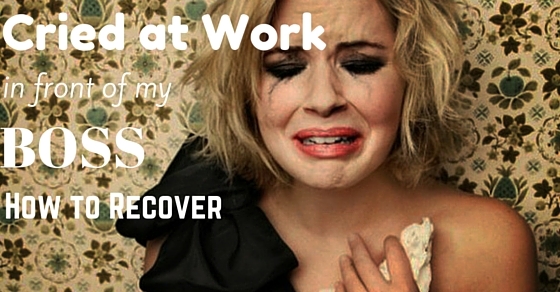 If you have cried at your workplace then you don’t have to panic. All you have to do is recover from the situation. You can’t be brave and strong all the time. Everyone has a melting point and so do you. So, stop pressurizing yourself and putting yourself down for crying. There are many ways in managing emotions in the workplace. Simmy was sitting with her boss in the meeting and was looking dull. As her boss asked her what happened, she was unable to control her emotions and down came the tears. She apologised for her sudden outbreak and discussed her problem with her boss. After a personal discussion, Simmy gave her a smile and went back to the meeting discussion. This incident could lead to a better bond between the junior and senior giving. Suppose you are not happy with the meeting or the discussion that is going on, there is no issue. You can excuse yourself and move out of the room. Take a small walk, compose your emotions and then enter the room. By moving out of the room, then you can refocus on your job with no outburst of emotions. Get your balance of mind and body back by taking a moment away from all the commotion. Your work is getting overwhelming and your emotions are taking over your mind. STOP whatever you are doing and close your eyes. Breathe in from your nose and breathe out from your mouth. Repeat this at least 5 to 10 times and you will see your emotions disappear. You can now restart your work with concentration and energy. You can pinch yourself to get back to reality. Whenever you see a good thing happening, you tend to feel that you are in a dream and pinch yourself back to reality. Similarly you can get back to reality by pinching yourself from a bad situation. But be careful that you do not pinch yourself too hard that you bleed. Be realistic and don’t be crazy! If a conversation is bothering you then you need to get out of it. Make a U-turn and change the focus of the topic from your emotions to something else. Quite often we stick to the conversation that is bothering us and end up getting overwhelmed. You don’t want to react then best thing is to change. A distraction will always help you to control your emotions. Do not show off that you were worried or upset on something. There is no point in keeping your reasons public and hence behave that it was the work pressure that led you to cry. Make sure that you express the feeling of “Just Like that”, till you are comfortable in sharing the reason. Get back to your jovial self and your colleagues will forget in a jiffy about your emotional outburst. There is no reason to justify, but a reason to acknowledge your behavior. You could always apologize to your peers by saying that you are sorry for crying at the workplace. But we are all under pressure and it had taken a toll on my emotions. I hope that I have not spoiled the meeting and we can get on with our discussion. Such sentences will make you and your colleagues feel better and confident. If you are grieving because of a tragedy or there is a personal situation like that of a divorce, then you need to take a break for a day. Gather yourself from the situation that you are facing before you join work the next day. There is no point crying at workplace every now and then. It is better to settle your emotions for good and rejoin work with complete focus. Taking a break will not hamper your career and work commitments. Women are not helping each other at the workplace. They don’t support each other emotionally or professionally and take competition to another level. As a matter of fact a male senior is more understanding and lends his support at your weak moment. It is quite surprising how a woman thrives for gender equality but when it comes to existing together their own gender it becomes a task. More than our colleagues we tend to pull ourselves down for crying. Are we right in doing so? The first thing that comes in our mind – Why did we cry? What will he or she think about you? What will happen to my career? We need to take a break and support ourselves with our emotions rather than being over critique. You can be expressive in your emotions but at the same time, you need to acknowledge your low. You don’t have to feel bad on what you have gone through and every professional in their work life has gone through the same phase. You can excuse yourself, assemble your focus and get back on your job. There will be no prying eyes on you if you are committed to your work. So, be brave and get back on the horse and deliver so that you reach new heights in your career.